Does the quipu was analogous to a system of calculation? Quipu from the Nazca Valley, Peruvian southern coast. Staatliche Museen zu Berlin Collections. Photo, taken from C. Arellano, 1999. Quipu wrapped with a red feather, as he kept when its use is completed. Museo Nacional de Arqueología, Antropología e Historia del Perú Collections. Photo, taken from C. Arellano, 1999. 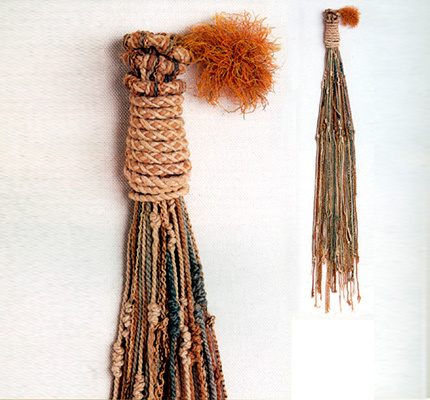 An extension of the Primary Cord served as a handle to hold the quipu while manipulated. The quipu was wound with this same cord when it was storing and its end is used to put a tuft of colored wool or feathers, probably to identify it, because many quipus have been found in the Inka tombs, along with sea shells in net bags, with the feather sticking out of the package. Very few quipus from the central and southern coast or Peru carry their Pendants Strings attached to a horizontal and decorated wooden handle, which also serves as a Primary Cord. 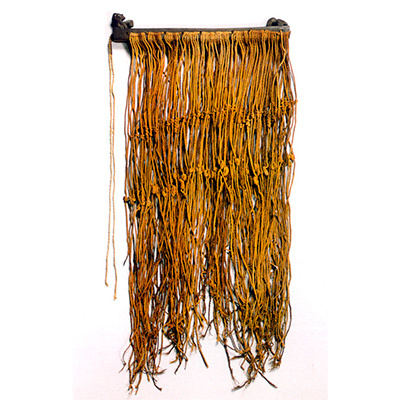 The meaning of these decorations and their relation to the type of information that would have been recorded in this type of quipu, is yet to be discovered.